Please refer to our stock # 3246 when inquiring. 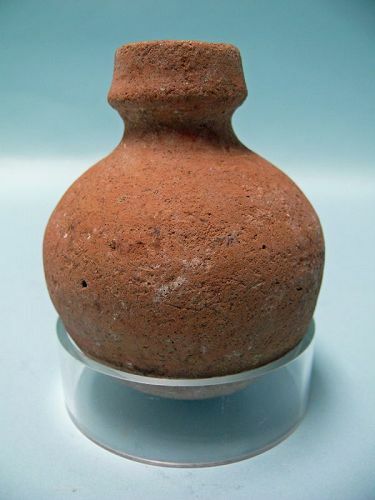 Middle Bronze Age II Globular Pottery Jar, ca. 2150 - 1550 BCE, found in the Holy Land. Buff in color, round in shape, expressive, wide neck. Intact and in excellent condition, 4" x 3" x 3". Pottery and ceramics have been produced in the Levant since prehistoric times. This period is divided into three different sub periods: MBII A, B, and C. We shall see that B and C are closer linked than A. This period is diagnosed by the well-burnished red slip so often seen in the corresponding layers at digs. The slip is normally used on the smaller vessels of the period. Other decorating techniques found to be frequent among this period's pottery are horizontal sometimes triangular designs in black or red paint.